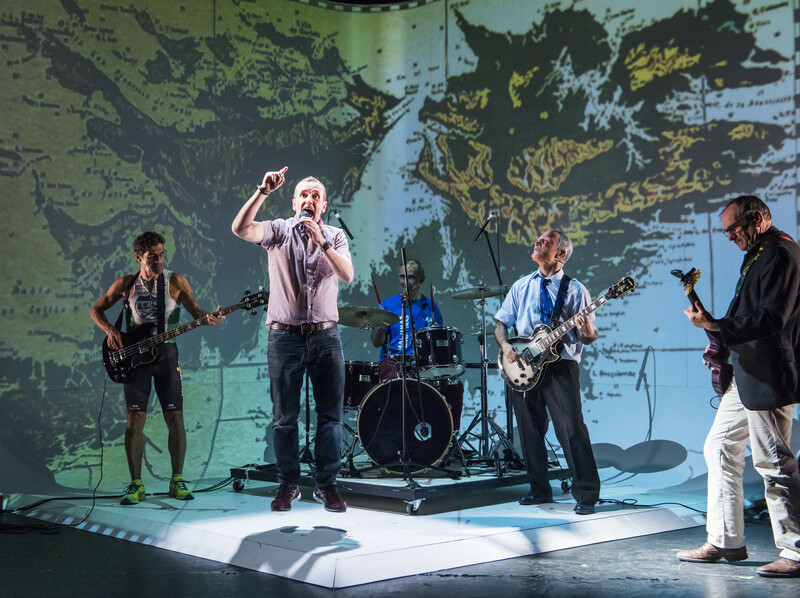 LIFT (London International Festival of Theatre) exists to the do the unexpected. Argentina’s Lola Arias works a miracle. 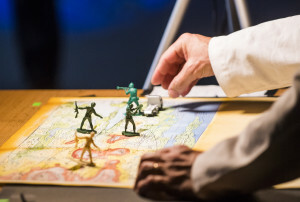 Taking former enemies in the Falklands War, she moulds them into a wholly different kind of fighting force in an act of reconciliation and rehabilitation. For make no mistake, these former soldiers on opposing sides – three British soldiers, three Argentines – show us the battle scars that linger although under Arias’s skilful guidance it comes to us as light and digestible as you could wish until the final moments when the full impact and legacy of fighting is borne down on us with a cathartic blast of punk. © Tristram Kenton, Marcelo Vallejo, Lou Armour, Ruben Otero Gabriel Sagastume and Lou Armour with `Have you, have you seen a man die’ and the Beatles tribute band. 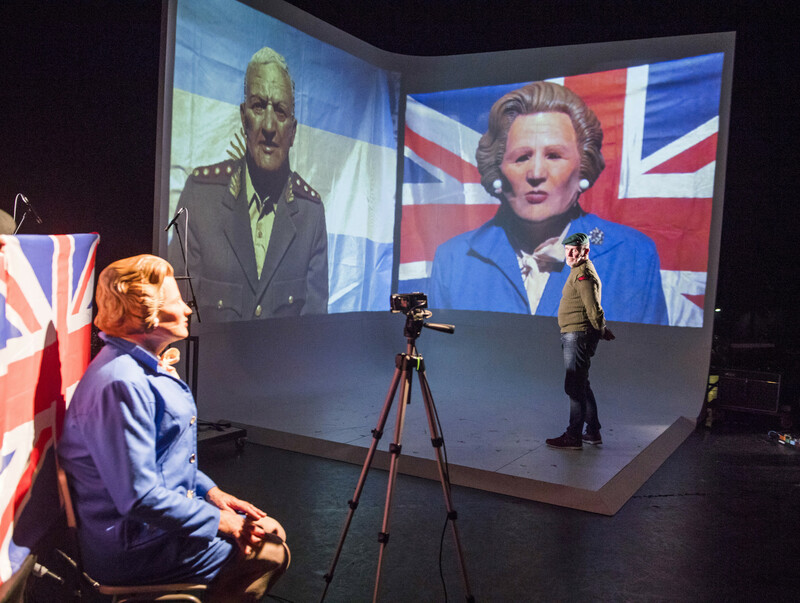 It’s a fitting pitch to an audience, few of whom will have ever seen action as Lou, David, Rúben, Sukrim, Gabriel and Marcelo re-enact, re-live and recount their journeys in the Falklands and after, through personal stories, split screens, video and art models. For not the first time, we hear of the miserable mistakes on both sides, in what amounts for all the jingoism expended, to a shambles of a conflict and one that inevitably left its psychological mark: PTSD with its recurring nightmares and the rest by any other name. Yet, in amongst the graveyard dead and mounting horrors – being a survivor from the Sinking of the Belgrano for one – Arias injects wonderful moments of hilarity: The Beatle’s `Get back, Get back, to where you once belonged’, bashed out with vigour by Rúben Otero, now a member of a Beatles Tribute Band (and no mean performer on a drum roll). © Tristram Kenton, Gabriel Sagastume, Marcelo Vallejo, David Jackson and Ruben Otero in the psychiatrist’s chair scene. Perhaps the most moving moment is that between Marcello Vallejo who suffered complete mental breakdown (now partly restored and a triathlon `Ironman’) with David Jackson in his new role as a veterans’ psychologist, sharing their common experience and the aftermath. Sobering, healing, there have been many theatre pieces over the past fifty years since the Vietnam War expressing war’s futility but never one done with such gentle humour, ingenuity and sense of camaraderie. 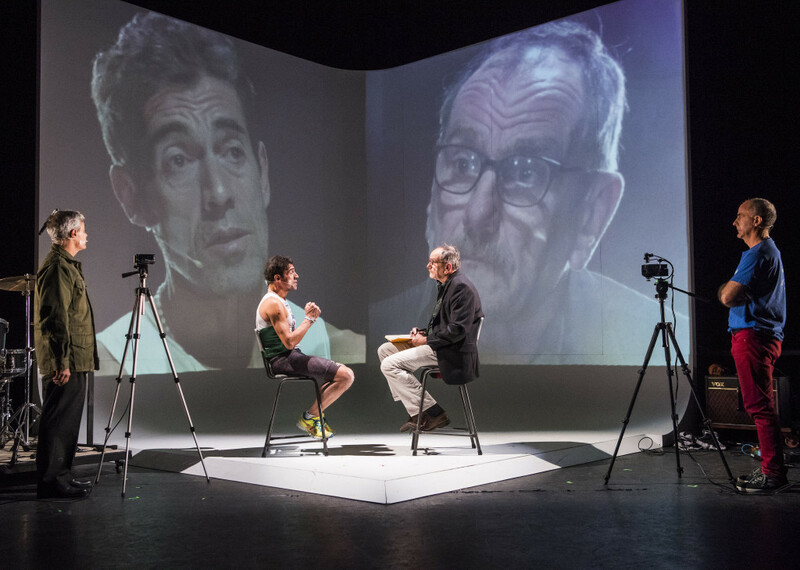 A Royal Court Theatre co-commission with LIFT, Brighton Festival, Universidad Nacional de San Martin, Le Quai Angers, Künsterhaus Mounsonturm hTh CDN Montpellier and Theaterformen. This entry was posted in 2016, Reviews and tagged Argentina/Britain, Beatles tribute band, Falklands, LIFT2016, Lola Arias, PTSD, veterans on June 14, 2016 by Carole Woddis.